This vibrant dish gets its colour and flavour from the wide variety of vegetables. Meanwhile, heat oil in large skillet on medium heat. Add chicken, onions and garlic; cook 4 to 5 min. or until chicken is no longer pink, stirring frequently. Stir in tomatoes, vegetables and seasonings. Bring to boil; simmer on medium-low heat 10 min. or until vegetables are tender. Drain pasta; place in large bowl. Add chicken mixture and cheese; toss to coat. Sprinkle with parsley. 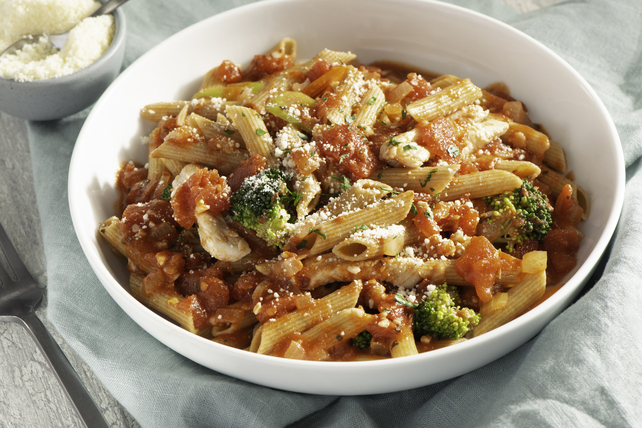 Prepare using any bite-size whole wheat pasta. This colourful dish provides an excellent source of both vitamins A and C. The broccoli provides vitamin A, while the red pepper provides vitamin C.